A burrito bowl from Chipotle! 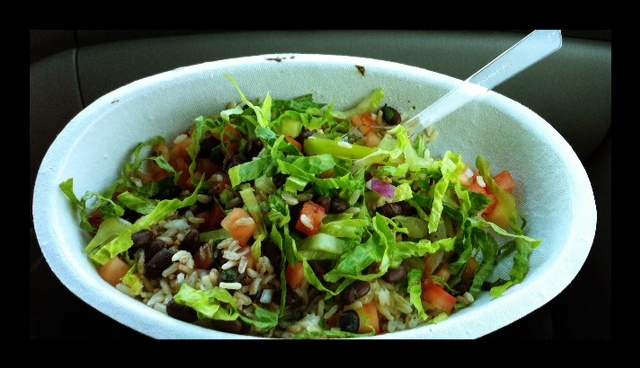 A little brown rice, some black beans, pico, and veggies and lettuce… what could have gone wrong? #1 – When you have a gluten intolerance, it can mean something else that acts “like a gluten” in your system. Those “Cross Contaminates” cause similar effects (to what gluten does) in your body. The proteins look “similar enough” to gluten – to your system – and your T-cells can attack them, like they would gluten…making you sick, and causing inflammation. This is why sometimes people STILL don’t feel well when they remove only gluten. It’s because they have other “Cross Contaminates” acting like gluten in their bodies. When they have a leaky gut – those CC often go right into their blood stream – causing major issues, as you might imagine. Often times the CC is lactose or casein, but it can be a whole host of others… for me, it was roasted things – coffee and nuts, as well as corn. (Corn technically does have a gluten, because it’s grain, and it is a confirmed inflammatory in the system. It’s just not one of the ones celiacs are specifically to avoid.). Trying to avoid corn and gluten isn’t the easiest task in the world – but I do feel so much better when I’m NOT on those things. That includes (sniff) my dear, sweet potato chips. #2 – It can be when you are having a “gluten-free” meal – at a restaurant or away from your gluten-free kitchen, and some wheat, barley, rye flour get in whatever it is you’ve ingested. This is why “gluten-free” meals that are in restaurants without “gluten-free kitchen training” can be very misleading and dangerous to those who have severe gluten intolerance. Take me for example. I excitedly went to Chipotle for the first time last week. Yes – as in, the first time… EVER in my life. I ordered a completely gluten-free dish. They have pretty good practices at Chipotle for persons with celiac disease/gluten intolerance. No flour should have been around my food… but…. A server – takes off his gloves, washes his hands – and replaces his gloves. Grabs my bowl (should have grabbed one from the bottom), and then puts my food in… while he’s grabbing the spoons full of food – this “clean” gloves are grabbing spoons that have been touched by gloves covered in”flour”. Then they grab some tongs to get my lettuce out, and I notice the other server – grabbing lettuce with her hands. OBVIOUSLY not a good practice as now the lettuce is all contaminated. I’m not sure what’s more unsettling. That something that tasted so good made me so sick, OR that I ate it to days in a row… so what my husband convinced me was “just fatigue” half way into the first day, built into a nasty swelling cycle that night after I consumed MORE – with major bloating, pain, muscle and joint pain as well as neuropathy. I wish I could explain the brain shaking feeling – but it’s scary enough, I really hope no one knows what I’m talking about! I looked like I’m 5 months pregnant again – and the pain the days after are not pleasant. Focused thinking/talking is about impossible. Please, be careful out there. I know it’s crazy that such a “little bit”, basically a dusting – can make one SO sick… but that’s honestly why I want those who are gluten sensitive to really consider their continued exposure to gluten CAN and will do to your system. Some of the reactions you will see and feel (like mine) and some you won’t know until it’s too late. I’m not sure which is worse – but it’s why gluten intolerance is such serious business if you’re genetically predisposed to a reaction. Do I want to live in a bubble? Obviously not. I’m really TRYING. But I’d be lying if I said it’s not a tad bit aggravating when I get knocked down like that. Who has a few days a week to just toss out to worthlessness, and fatigue, grouchiness and pain? Back to my Aleve! We have school starting TODAY – and we had a fun scavenger hunt to kick off our new year. The children are EXCITED. Gotta keep moving and SMILE! THIS is the day the LORD has made – I am GLAD for that. Posted on July 23, 2012, in Celiac/Gluten Sensitivity, Our Struggles, Truth and tagged chipotle, cross contamination, Eating out gluten free, gluten free. Bookmark the permalink. Leave a comment.